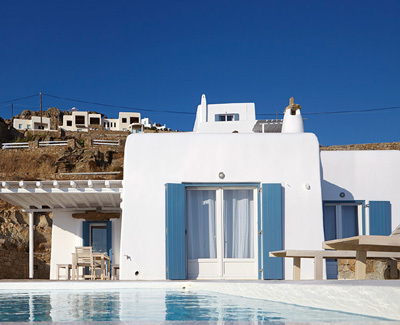 The most romantic Villa at Lights of Mykonos is decorated in the shades of Cycladic white and pale grey which come into an interesting antithesis with the blue of the Aegean and the brown of the Cycladic wild nature outside. Its traditional architecture ties perfectly to the whole landscape and the blue of the sea which are easy to admire at every pace through the large windows. The Villa offers a private swimming pool, 4 bedrooms, 3 bathrooms, a living room, a dining area and a kitchen. The living room leads to the outdoor private space which boasts a swimming pool with sun beds while the kitchen is adjacent to the outdoor dining area with a large table and chairs under the shade of a tent.